After defeating the Elite Four and becoming the newest Kanto Region Champion, you can rematch the Pokemon League whenever you would like. When facing the Elite Four again, each member will use the same Pokemon as before (but at higher levels), as well as adding one Alolan Form Pokemon to their team that matches the type of Pokemon they specialize in using. You will continue to earn loads of Experience and Money when you rematch and defeat the Elite Four. When it comes to Lance, the fourth and final member of the Elite Four, he will still use a rather balanced team overall. This is because Lance is a Dragon Type Master, and, unfortunately, there aren't all that many Dragon Type Pokemon found within the Kanto Region. He will continue to battle with Seadra, Aerodactyl, Gyarados, Charizard (which will turn into Mega Charizard X) and Dragonite. However, he will also use an Exeggutor in its Alolan Form in this battle. This time around, all of his Pokemon will be at Level 64, with the exception of his Dragonite that will be at Level 65. Even though Lance has very balanced team, Electric Type Pokemon actually work best against Lance's Pokemon Team. This is because his Seadra (a pure Water Type), Aerodactyl (a part Flying Type) and Gyarados (a dual Water/Flying Type) are all weak to Electric Type Attacks. Ice Type Pokemon and Attacks also come in handy when facing Lance in a rematch, since both his Alolan Exeggutor and Dragonite are x4 weak to Ice Type Attacks. As for his Mega Charizard X, Ground/Rock Type Pokemon usually fare best against it. 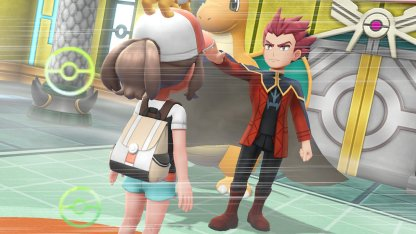 Finally, make sure the Pokemon you do use against Lance are at Level 65 or greater, as this will allow you to match up well against him and the rest of the Elite Four.